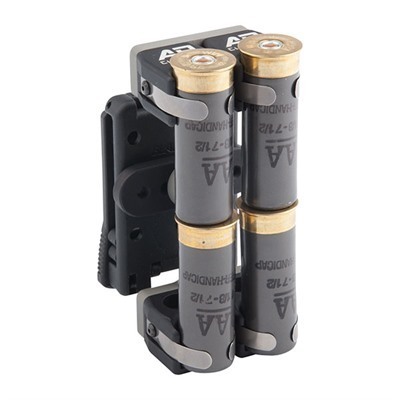 The AP Custom QL Series of shotshell carriers facilitate the hot new shotgun loading method, the “quad-load”. The quad-load utilizes the same basic concept of loading as the “load-two” method, except that the shooter grabs four shells at once. 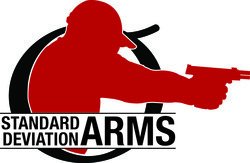 This saves the shooter valuable time in competition as the hand movement to and from the belt is reduced by 50%. The QL requires just a little more practice to reach proficiency than the L2. Like all AP Custom shell carriers, the QL Series of shotshell carriers is CNC machined from solid billet aluminum, and use our proven 303 Hi-Yield springs to withstand the most rigorous use. The L2 Series is designed to retain 12 ga. shotshells of any length. The QL/4 is a 4-round 12 ga. “quad-load” system consisting of a single QL shell carrier mounted to an adjustable billet aluminum backer plate on a Blade-Tech Tek-Lok. The QL/4 backer plate allows the shooter to adjust the angle of the QL to his or her liking. The backer plate is also drilled and tapped to accept Safariland ELS and Blade-Tech MOLLE attachments. The QL/8 is a 8-round 12 ga. “quad-load” system consisting of a two QL shell carriers mounted to an adjustable billet aluminum backer plate on a Blade-Tech Tek-Lok. The QL/8 backer plate allows the shooter to adjust the angle of the QLs to his or her liking. The backer plate is also drilled and tapped to accept Safariland ELS and Blade-Tech MOLLE attachments.